Seattle finally has entered a new age of mass transportation with the arrival of the South Lake Union Trolley (S.L.U.T.) We want everyone in America and the world to come Ride Our S.L.U.T.! Now that the Trolley is here, Show YOUR support for mass transportation by ordering your S.L.U.T. shirt today – while supplies last. When ordering, please remember your best friends! Rory at Fifth Door Films knows how to buy a present! Oh, and that's Cary Elwes. Only one of our favorite actors ever! 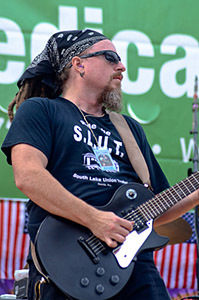 Stevenflow Rosenstengel from the band Upwell, sports the S.L.U.T. for Upwell's 2012 Hempfest performance. - photo courtesy the Seattle Weekly "The People and Pieces of Hempfest 2012"
SEATTLE PI: "25 Seattle coffee shops we miss"
McGinn's Seahawks-Saints Bet: No 'Ride the S.L.U.T.' T-Shirt? Yesterday news circulated of Mayor Mike McGinn's wager with New Orleans Mayor Mitch Landrieu over Saturday's Saints-Seahawks playoffs game. The items McGinn is laying on the line: a pound of smoked salmon; a dozen Top Pot maple bars and some yet-undefined "music from the Seattle scene." Seattle Times: Streetcar cost overruns: What about the next line? subject: Are streetcars the answer? 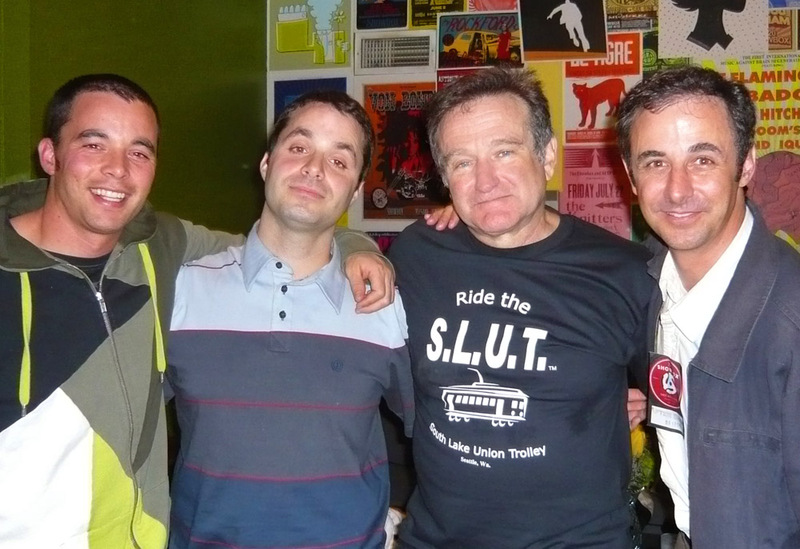 Mr. Williams was in Seattle for a series of charity events he did at the Showbox benefiting West Seattle Food bank, The Humane Society and the Seattle Repertory Theatre. A true humanitarian, gone too soon, he will be missed. 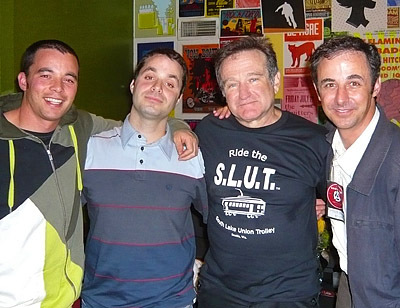 Rest in Peace Robin. Original trademarked shirts are available only at www.ridetheslut.com (aka, here!) and in person at Simply Seattle (Downtown and Waterfront Locations) and the University District Piece of Mind. Huskies Purple shirts only available online at www.ridetheslut.com and at University District Piece Of Mind. Prices: $15.00 per shirt, plus $5.00 for Shipping and Handling per shirt. *PLEASE ALLOW UP TO 3 - 4 WEEKS FOR DELIVERY! *Exchanges may be made at point of purchase, and must be free of whiskey, smoke, and blood. You will not be charged for shipping to make your first exchange. Unfortunately, we aren't able to offer free return shipping. *Enter Slutshirt@hotmail.com in the "To:" box. *Enter the total $ amount of your order (including shipping) in the "Amount" box. *In the "Message" box at the bottom, please indicate color, size, style, # shirts you would like to order. *You will receive confirmation emails from Paypal and Slutshirt@hotmail.com. SEATTLE PI: South Lake Union likes the S.L.U.T. Listen to Big Jerry featured on "Weekday"
© 2007 Don Clifton. All Rights Reserved. “Ride The S.L.U.T.”, "South Lake Union Trolley", the Trolley logo, and other design aspects are trademarks of Don Clifton.